If someone would have told me I’d find modern dining comparable to NYC here in Warsaw, I would never have believed him/her. But Warsaw continues to surprise me! This spring, we dined on some fantastic raw oysters, foie gras, escargot and grilled sweetbreads at Brasserie Warszawka, which recently received a Bib Gourmand in the 2014 Michelin Guide Europe. We had three courses and a juicy bottle of French Gigondas red wine at a third of the price we would pay in NYC! We enjoyed our meal at the Brasserie so much that we returned just two weeks later and have recommended it to all our friends. 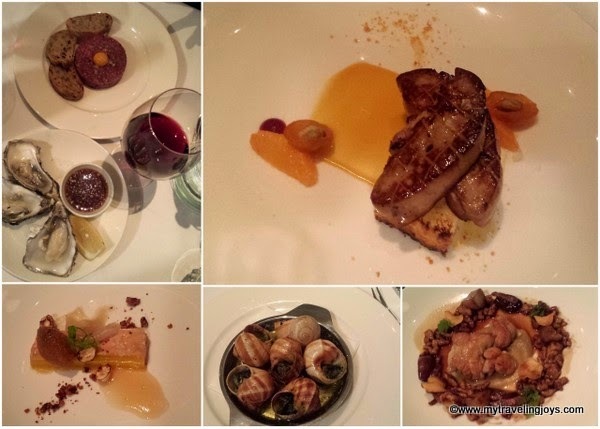 A fantastic dinner of French classics such as foie gras, raw oysters, escargot and sweetbreads. During the past year, I’ve also dined at two spectacular, modern restaurants and wanted to share my experiences and photos with you. I feel like I’ve only hit the tip of what fine dining could be and WILL BE in Warsaw. 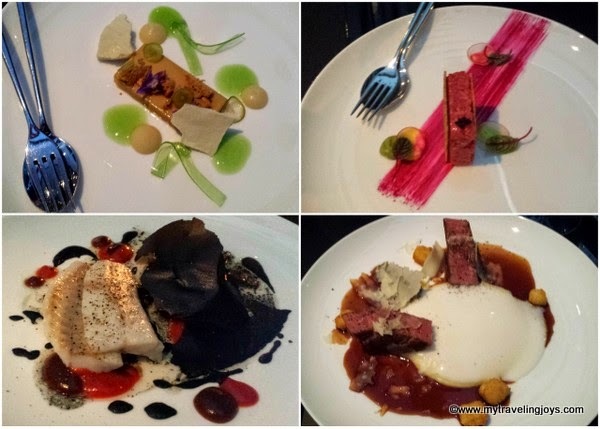 For my birthday dinner last May, I was looking for a nice place and stumbled upon this article: 5 Best for Fine Dining by Warsaw Foodie where Nolita was listed. I liked the menu online as well as the name (named after a neighborhood in NYC), so I made a reservation for us. When the server at Nolita showed us to our table for two right in front of the open kitchen, I thought this was the best birthday present ever! I’d rather have a memorable meal than a physical present any day. My husband decided to splurge since it was my birthday in our new city, so we started with raw French oysters with yuzu salsa and glasses of bubbly champagne. 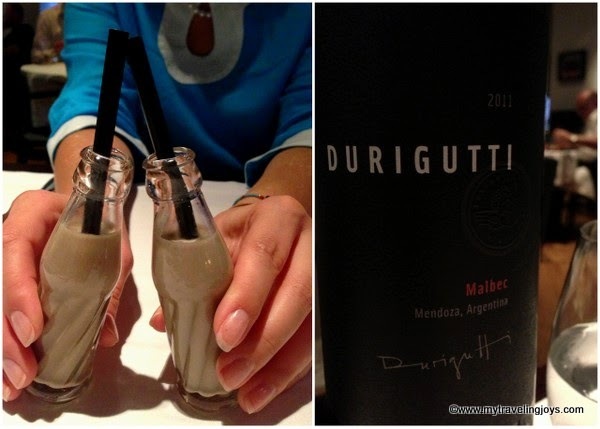 Next, the chef sent an amuse-bouche of creamy porcini mushroom soup in the most darling, tiny glass bottles. For our appetizers, I selected the decadent foie gras with rhubarb sorbet served in a tiny canning jar and homemade brioche while Jason had the scallops. I was in heaven! Appetizers and entrees at Nolita. Throughout my birthday dinner, I watched chef and owner Jack Grochowina and his all-male team cook and plate the restaurant’s dishes. I love the “dance” that happens in a well-run kitchen! I dreamily reminisced about my long days in the professional kitchen. Prices of appetizers range from 13 to 59 zł, and main courses cost from 70 to 129 zł. Nolita was the perfect choice for our date night and special occasion. But the price is a bit steep to make it a monthly occasion, unfortunately. Even Nolita’s dessert impressed me! 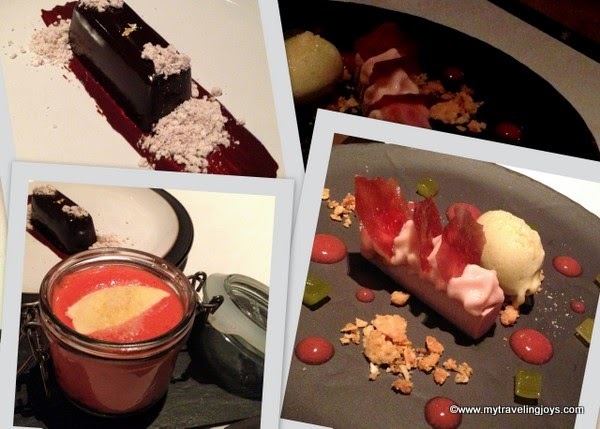 A sweet, but tangy rhubarb parfait with rhubarb ice cream for me, and hubby indulged in a glossy chocolate praline gateau. We were even served a refreshing rhubarb sorbet as part of the dessert course. 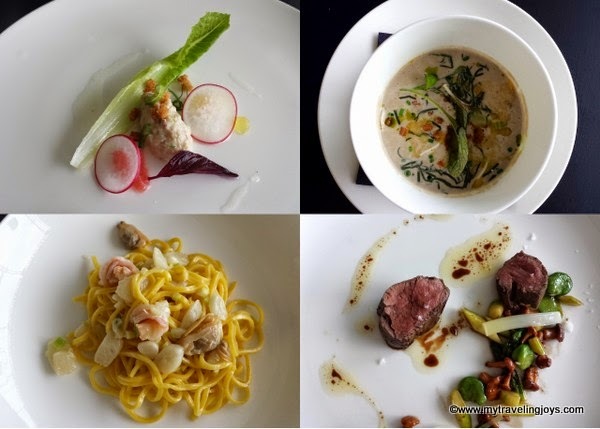 Another modern restaurant, Concept 13, in Warsaw offers an enticing 5-course set lunch menu for only 50 zł (about $15 USD). That’s an unbelievable steal! 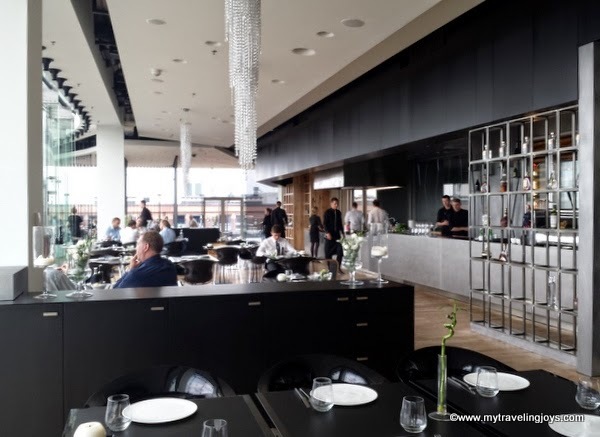 This restaurant is hidden on the fifth floor of a luxury shopping center in Centrum called Vitkac, which is owned by the Polish Likus Hotel & Restaurant group. You have to pass by the gigantic Louis Vuitton store on the ground floor to access the elevators. I never would have guessed there was a restaurant and wine bar in this building. There are even outdoor tables with a view over the busy streets of Nowy Swiat and Aleje Jerozolimskie. Our first course was a tiny crab salad with cucumber – a perfect, light course. The second course was a creamy mushroom soup with “roasted butter” and croutons. Third, tagliolini with vongole and shrimp – a little too fishy for me. The main course was deer loin with chanterelle mushrooms, fava beans and asaparagus – a very impressive showing of the season’s vegetables, but the meat was served a little too rare for my palate. 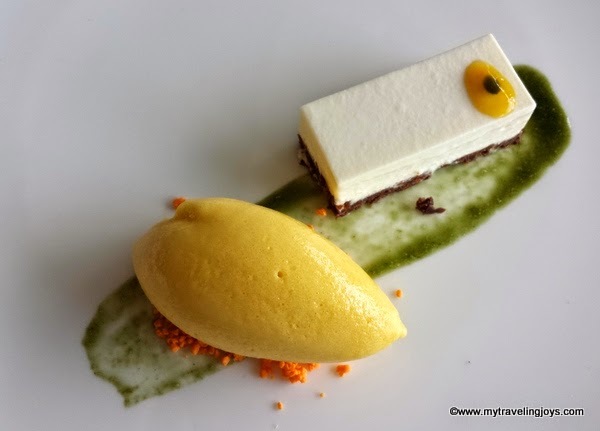 For dessert, the set menu included a white chocolate mousse with passion fruit sorbet, mint and “orange chocolate.” This is another type of dessert I would’ve made at my restaurants as I recognized the perfect quenelle of sorbet. The restaurant’s website states Chef Arkadiusz Janczarek and his team of cooks prepare dishes from the highest-quality and seasonal ingredients. I couldn’t find much information about him online, but I did find some of his food photos on this site: Chefs-Talk. 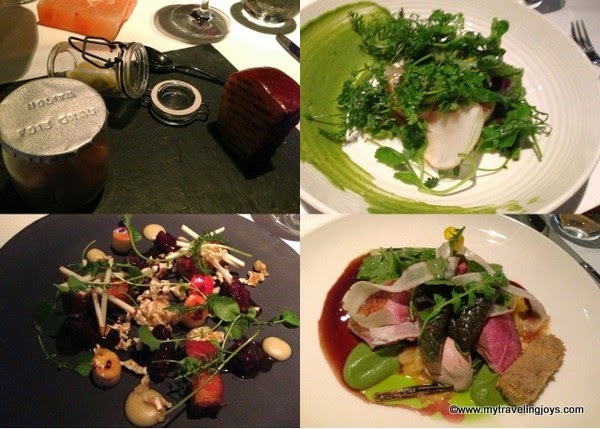 We’ve since dined at Concept 13 a couple of times, and while good, it just doesn’t WOW me especially for its expensive price tag. Dinner options at Concept 13 include foie gras, steak tartare, fish and a steak fillet with too much foam. Both Nolita and Concept 13 could be considered special occasion restaurants as well as a splurge for a fancy lunch. Hopefully, Warsaw’s dining scene will continue to develop more restaurants like these. 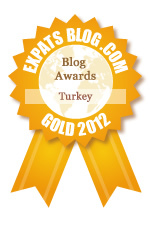 Best places for anniversary, birthday, special occasion dinner or a splurge. Beautiful and impressive - looks like Warshaw is becoming a weekend destination sort of place! oh yum! i haven't had a good escargot in a while and i love it! late happy birthday! I'm so glad to have these recommendations! We ate at Antilier Amoro last time we were in Warsaw. It was great fun, but not something that could be a regular item in our budget. Thank you! I love escargot once in awhile too!